The Dairy sleeps two adults and is a light and airy ground level cottage. 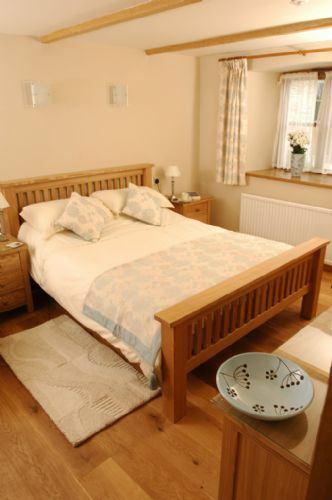 Lovingly finished with a high level of care it’s a stunning cottage for a lovely Cornish holiday. One of the best self catering holidays we have ever had, and outstanding value for money. The Dairy has been carefully renovated to an outstanding level. Everything is extremely comfortable and all facilities are of a high standard and work faultlessly. The grounds are beautifully maintained. The location is tranquil and convenient for the coastal path and attractions such as the Lost Gardens of Heligan and the Eden Project. We were warmly welcomed on arrival and the cream tea was delicious. Nothing was too much trouble for Barbara and Mark. We are intending to return. A excellent, high specification, self catering accommodation. The Dairy is the highest spec self catering accommodation we have stayed in. Can really recommend it, you will not be disappointed. Absolutely everything you need was provided. The Dairy was lovely and warm, very welcoming and we felt immediately at home, a really comfortable bed, we had a great 7 night's sleep. It really was " home from home " and we felt really relaxed there. We'll be back. Barbara and Mark were excellent hosts, the cream tea on arrival was delicious and most welcome after a 5 and 1/2 hour drive. The fresh flowers in the kitchen and sitting room were a lovely touch and very thoughtful. Have just spent another week at the Dairy which we thoroughly enjoyed despite storm Freya!Looking forward to returning in November.Barbara and Mark are wonderful hosts and Lucia and Max their lovely dogs gave us a great welcome. Thank you yet again for another wonderful short break in the Dairy. Mark’s scones were most welcome. Once again everything was spotless and comfortable. We are beginning to consider Roundhouse Barns as our second home in Cornwall. Dear Ian You are most welcome. thank you for your kind words. I can only find positive thoughts and memories of our stay, at Roundhouse Barns. If you seek exceptional hosts and tranquility, alongside first class accommodation; then look no further. The accommodation is set in beauteous remote location, which adds to the unique allure, that further ensures you will always want to return. Lovely stay, very clean, with lovely touches like cream tea, Cornish pasties & fresh flowers. Lovely walks. Would definitely stay again. Magnificent. Travelled to the beautifully unspoilt Roseland peninsula on many occasions the dairy at round barns is an exceptional base. The accommodation is outstanding on all levels. The professional standards are unsurpassed. We enjoyed another week in the Dairy,so clean and comfortable in a beautiful location.Barbara and Mark are wonderful hosts and their cream tea is to die for.Best scones on the Roseland.We met Max the new puppy who is so cute and a lovely companion for Lucia.We look forward to returning in the Spring. Once again had a lovely relaxing stay at Roundhouse Barns. The weather in November was very mild and sunny. Had lunch outside on several days followed by walks along the beaches nearby. The location, standard of accommodation and lovely hosts, Barbara and Mark, is what brings us back to this part of Cornwall. Looking forward to our return in early spring 2019. The attention to detail and cleanliness were outstanding - we have never stayed in a self catering cottage that has been so well maintained and our three night break was a joy. A Perfect Place in the Country. Having stayed at the Roundhouse Barns for many years I can highly recommend this location for anyone who loves the peace and tranquility of the countryside. The coastal walks and nearby villages and towns provide plenty of interest for those who like to walk and water with abundance of Pubs Tearooms on route, not to mention National Trust Gardens. The accommodation is absolutely superb in every detail and more than justify's the many competition awards it has received over the years. The proprietors Barbra and Mark are delightful, with at least one on hand to guide and help as required. We have been return customers since Barbara and Mark purchased the property and wouldn't consider staying anywhere else. They are perfect hosts and the cottages are of very high standard, very clean, comfortable and well equipped. I'm very fusy where I stay but know I can relax at Roundhouse Barns. A well thought out and equipped holiday home that we could have happily lived in. An excellent location. Rural peace and quiet with a Mediterranean feel! I really cannot fault our stay at The Dairy - we arrived to a cream tea, strawberries and champagne and soon began to unwind in the cool, calm surroundings. There were so many little extra touches like the welcome card and pack of postcards and the luxurious bath salts. The cottage was spotlessly clean and well equipped but my favourite part was the garden with its Mediterranean feel where we were able to sit out in the sun for coffee and long into the evening with wine. A truly relaxing break! We spent a week in May at the Dairy. The property is beautifully furnished and comfortable. A wonderfully equipped kitchen, a very glamorous bathroom and a cosy lounge. All set in a very pretty garden. Barbara and Mark were extremely good hosts, providing us with a welcome of homemade scones, jam and clotted cream., and on departure some Cornish biscuits. 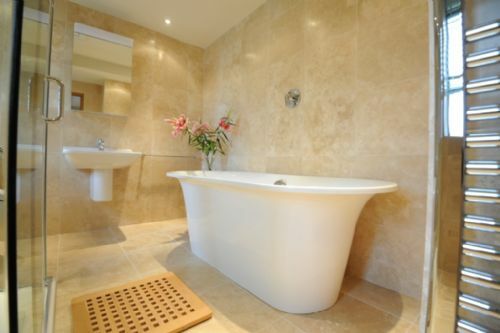 The property is very conveniently placed near to many places of beauty and interest, including the King Harry ferry. All in all, a wonderful week in a beautiful part of the world! Thank you so much for your kind review, we also love The Dairy bathroom, we wish ours was that big! So glad you had a lovely time exploring Cornwall, we hope to see you again soon. From Winter to Summer in a Spring stay at Dairy. We timed our stay to correspond with the plant displays in the gardens across Cornwall. In this we certainly were not disappointed, except perhaps not having time to see them all. We certainly appreciated returning to the Dairy in the evening knowing that what ever the weather we would be warm and cosy. We stayed in two nights enjoying local food and ventured out on the other nights, not to be disappointed with the food where ever we went. The Dairy is just ideal in a wonderful location and we will certainly return. We had another wonderful holiday at the Dairy despite having snow.It didn't last long and was very pretty. The cottage was warm and cosy.We are looking forward to returning in November. Our third trip to Roundhouse Barns and second stay in the Dairy was every bit as lovely as we hoped it would be. Our arrival was delayed due to the dreadful snow , but when we finally arrived we settled straight back in and felt immediately at home! We received a warm welcome from Barbara and Lucia, the lovely black Labrador and enjoyed Mark’s scones! We love the location of the cottages, it is so peaceful at night and there are lots of places to visit within an easy driving distance. There are also great walks on the doorstep, in particular down the lane to Turnaware point, which is a great end of the day or early morning walk. We also loved Cockle cottage but somehow the Dairy has become our favourite! We look forward to returning soon. Thank you for a truly relaxing break in a beautiful location. The views at the top of the drive are amazing. We stayed in The Dairy, and we couldn't fault the accommodation. We had everything that we needed . Cream tea when we arrived and all the home comforts with comfy sofas and big fluffy towels. Thank you do much, we hope to return soon. A beautiful cottage with peace and tranquility. This is the perfect cottage for a peaceful break. 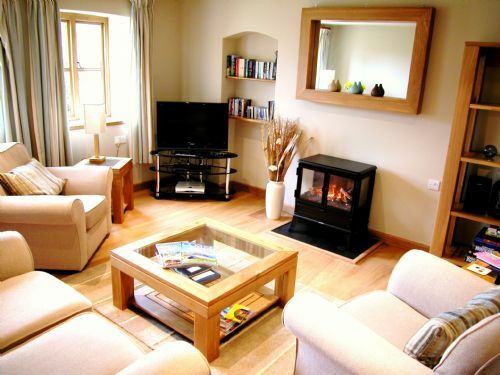 The Diary is warm and cosy and beautifully decorated, furnished and equipped to a high standard. The bed is superbly comfortable and the bathroom is high grade. The kitchen/diner is spacious and has everything you need. The lounge is very attractive. Barbara and Mark are very friendly and helpful. Two minutes or so gets you to the delightful King Harry ferry across to the outskirts of Truro or you can explore the stunning Roseland peninsula. Don't miss the truly lovely church at St. Just. Excellent. So glad you enjoyed your stay in The Dairy. Everyone loves the Super King bed, which is a Hypnos and lovely and comfortable - just what you need after a day out and about on the Roseland. We love the h church and gardens at St Just as well, beautiful and so peaceful. Hope to see you back again. The Dairy is a wonderful place to stay,it really is home from home.We have stayed here several times,have just spent another week and looking forward to our return in march.Barbara and Mark are so welcoming and the cream tea on arrival is the best we've tasted on the Roseland. This is my 4th visit to the dairy so it was nice to see the changes. A peaceful and restful stay with plenty of walking and relaxation. A really great spot. Great for access to St Mawes, Falmouth, Truro and further a field. Cottage was a delight - a very comfortable home from home. We would thoroughly recommend it. We had a great two weeks staying in The Dairy. I have shown the location as " Good" only because there wasn't a Very Good option. 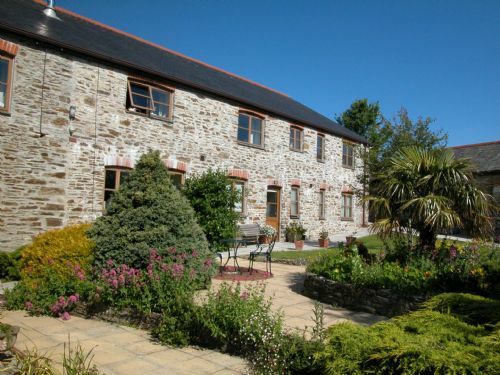 The Roseland Peninsula is beautiful and if your intention is to stay in this vicinity the it is an excellent location. But if you are looking to travel to other parts of Cornwall then it can be a bit of a drive. BUT this would not stop us from visiting this area again and definitely choosing at Roundhouse Barns. Without doubt the best cottage we have stayed in. What more could we want from a holiday! We just wanted a quite relaxing week in comfort and that's exactly what we got. Beautiful cottage with everything provided - didn't feel tiny like some '2 people' cottages do. Bedroom & bathroom were excellent, Kitchen was well equipped and lovely to sit with door opening on to the garden. Sitting room was spacious and comfortable to relax in after returning from sampling another place off the recommended pubs/restaurants list. Had some lovely meals and plenty of variety. When you first arrive you think how far away everything is but within a day you are nipping along the roads and into to St Mawes in 7 minutes! A beautiful location and interesting history down the lane at Turnabout Point & the D-Day preparations. Barbara & Mark were full of helpful advice which we appreciated. We were fortunate that the weather was perfect but we always know if there was a bad day we could snuggle down in our comfortable cottage and still enjoy ourselves. Plenty of attractions in the area, pity we missed the flowers at their best but we'll just have to come earlier next year. Have always enjoyed this area since visiting as a child and so glad we have found a good retreat to return to. Thanks again for a wonderful holiday - and pet therapy thrown in - what more could you ask!! This was our second stay at Roundhouse Barn Holidays. We loved Cockle Cottage but it was unavailable and so booked he Dairy. We loved it as much, if not more. We arrived early in the day to a hamper of items enabling us to cook breakfast, unpack and set straight off for a lovely afternoon walk, before returning to enjoy freshly baked scones! . This set the scene for a fabulous week. we walked miles, cooked lovely meals in the well equipped kitchen and slept soundly in the comfy super king sized bed! The cottage also has plenty of storage space, a cosy lounge, with sky tv and music system, and a large bathroom with separate shower Barbara and Mark are around but not intrusive and Lucia, the dog, is great entertainment but well controlled. We can't wait to return. We were blessed with sunshine during our February stay at The Diary and were as delighted with our accommodation as we were the weather. Our very late arrival was no problem and our hosts were more than accommodating throughout the week. Their attention to details is refreshing and we had no questions or issues of any kind. Our accommodation was of high quality, beautifully clean and well kitted with all the essentials. We would definitely recommend this little gem and will definitely be returning. This is our second visit, which in itself is saying something as I don’t recall us ever going to the same place twice, (due to one of us being extremely fussy). The dairy has everything you need for your stay with the exception of food, although you are even given a head-start with that with the provision of 4 lovely scones, jam and clotted cream – the perfect accompaniment to a cup of tea immediately following the unpacking. The house is warm and comfortable. The location is very quiet day and night and is dark at night, (which you may appreciate if you live in an urban environment and are used to constant sodium light pollution). The owners are really nice, as are the 2 dogs who are the first to greet you upon arrival. To summarise: I arrived, relaxed for 4 days, left 6 pounds heavier. 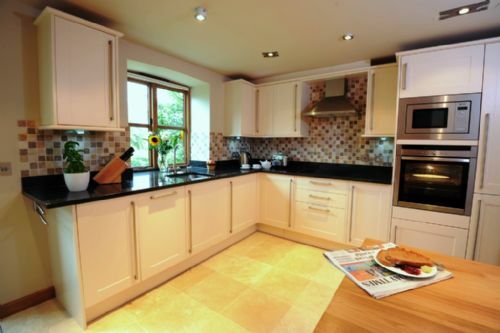 A delightful cottage which has been fitted out to a exceptionally high standard. A wonderful home made cream tea welcomed us on our arrival which was a lovely touch. Lots of literature to browse if you are new to the area including places to eat, whether it is fine dining or just a pint at the local pub, which is so helpful. Just a short walk down the drive to a breathtaking view with wonderful walks. Looking forward to staying here or one of the other two properties in the Spring. This is a lovely peaceful place to stay. The accommodation is excellent with everything you could want and more. Lovely walks from the cottage and plenty of places to visit with only a short drive. Barbara and Mark have created an idyllic place to unwind. We would thoroughly recommend these cottages. We are regular visitors to Roundhouse Barns and have been since Barbara and Mark first took over. 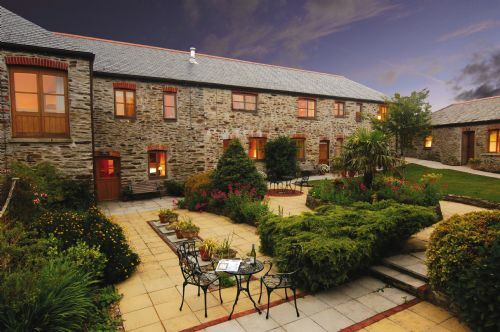 We love Cornwall and since we first stayed at Roundhouse we have never considered staying anywhere else. Why would we when we have everything we need there. Its a true home from come, comfy bed, sofas, stunning bathroom and kitchen with high end appliances etc. But most of all our hosts are so friendly and welcoming and nothing is too much trouble. We had a first-class week at Roundhouse Barns, even walking into St. Mawes via St. Just.& back.Otherwise it is very convenient to get into St. Mawes for the various ferries and also to get to Portscatho for some excellent walking on that coast and great fish & chips from the Atlantic Fryer mobile van. On the Facebook page a guest mentioned Mark's amazing scones in the lovely cream-tea welcome., probably the best we have tasted. A great place for two. An excellent place to stay, with a great location with lots to do in the area, ando plenty of places to eat if you don't feel like cooking. Would happily return in the future. One word sums up The Dairy - FAULTLESS. It was so well presented everything appeared brand new! Barbara was an excellent host, providing help and advice when required. Unfortunately we didn't get to meet Mark. We were celebrating our 30th wedding anniversary during our stay and the gift of a bottle of champagne was thoughtful and well received, a nice touch. The cottage was well placed to explore Cornwall and the local pubs were excellent for food and to sample the local real ales(special mention for the Roseland Inn & Kings Head). St Mawes is a beautiful harbour just a few miles away and we spent a number of hours there just relaxing and watching the world go by! All in all a great holiday and I'm sure we'll be back in the near future. 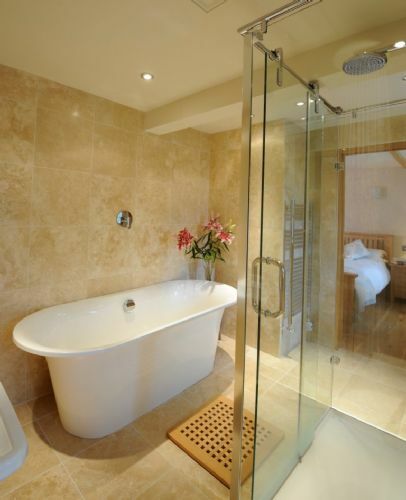 The cottage was exceptionally well equipped and had quite recently been refurbished to a very high standard. Barbara and Mark were friendly and helpful hosts and kept the surrounding gardens beautiful. Although the property is away from built up areas, reaching west Cornwall sites is quick and easy. St Mawes is 5 miles away and both Fowey and St Ives can be reached in under an hour. We thoroughly enjoyed our stay and plan to go back next year. Our accommodation had everything that we required to ensure a great self catering holiday. A well equipped kitchen and the accommodation itself was tastefully furnished with all mod cons. There was also a lot of information re the local attractions as well as further afield. We'll be back. We combined Dairy with The Suite for two days when we had a great friend to visit.Worked very well as we had extremely comfortable accom.with great help from Barbara/Mark enabling this reunion.Fine surroundings in pleasing countryside.Thank you very much.N/P/R. We have stayed many times at Roundhouse Barns, both B&B and self catering. It's like returning to your very own holiday home with a wonderful warm welcome and a cosy beautiful cottage to relax in. The Dairy has to be one of my favourite. It is well laid out, spacious, luxurious and Barbara and Mark have provided every piece of equipment you may need in the kitchen, with games, videos, books, music etc in the lounge. Incredible attention to detail and we had the most wonderful stay, so much so, we extended our time! Thank you again for a special holiday and lovely company, until next time. We have stayed twice at Roundhouse and it is the perfect place for a peaceful and relaxing break. Very quiet and no light pollution. Lovely scenery in the area and lots to do. This was our first stay at The Dairy. We had previously stayed in the bed and breakfast accomodation and always been amazed by the gorgeous rooms and Barbara and Mark's hospitality. Needless to say The Dairy was up the same high standards and the welcome as warm as ever. We will be back as soon as we can! Yet again another peaceful and relaxing time spent at Roundhouse Barns the accommodation was excellent and up to high standards we have always been used too. Grand holiday at the Dairy. As former members of the Holiday Property Bond we found that the Dairy was better in every respect than comparable cottages provided by the Bond.An outstanding facility. Well done Barbara and Mark. As usual Barbara & Mark had done all the little things & more to make our stay memorable. Mark's scones were scrumptious as usual & the personal welcome plus other gifts were really appreciated. This was the third time we have stayed at Roundhouse Barns & we would sincerely recommend it to couples who want luxury & a special location. Cornwall is fantastic but the Roseland is idyllic no matter what time of the year. Oh, we forgot about Barney. He usually pops round each day to say hello & see if he can scrounge some tidbits. Many thanks. Looking forward to our next stay. An ideal cottage for an 'away from it all' break in one of the most wonderful areas in the country. What better way is there to start a holiday in Cornwall than arriving to find fresh scones, Cornish clotted cream, and fresh jam on the kitchen table! Booking was well managed and easy. We were sent details of everything that was included and good directions. The Dairy is very attractive and well furnished. Excellent bed and quality linen. Well equipped bathroom and kitchen. Arm chairs and Sofa very soft, which would be fine for some people. We were warmly welcomed by Barbara and Mark and found fresh flowers, scones, clotted cream and jam awaiting our arrival. The gardens surrounding the cottages is well designed to afford a little privacy for each cottage. Full of colour and well maintained. Being well away from the road and just a mile from the sea it is very quiet and peaceful. Pleasant walks from the cottages. We were holidaying with our daughter and Grand children and it was the perfect retreat at the end of a tiring day. Would love to stay there again. A very relaxing stay in The Dairy at Roundhouse Barns. The accommodation is of a very high standard with a large kitchen with built in appliances, a living room with comfortable seating and a large TV (with sky) DVD player with a selection of films, small Hi Fi and an ipod stereo, bathroom with large shower and roll top bath and a bedroom with the most comfortable bed that we have ever slept in away from home. The location is a very good one for south Cornwall, but most places are a good drive away, so for sightseeing be prepared for a car journey to get there . Cannot fault this stay, however if you need to be constantly connected to the modern world, Wi Fi is hit and miss and you may have to walk to the top of the drive for a phone signal - but that's Cornwall!! Hi Sorry about the WiFi - we have been trialling satellite broadband - but sadly it has proved to be worse than what we had before! We have disconnected it now and gone back to BT and will keep pushing to get Superfast Broadband here. In the meantime we are back to a connection that will let you email, surf the web and stream music - but is not fast enough to stream videos or films. As you say one of the joys of living in a rural area! Fantastic holiday in a wonderful place. Quiet and peaceful location, but central enough for days out in St Ives, Heligan and the Helford Passage. Delightful walk from St Just (park in church car park) to St Mawes along the cliff path. Our stay at the Diary was wonderful. This was our 5th visit to the Roundhouse Barns and we booked our next holiday on the day we were leaving! Always so relaxing, Mark and Barbara are wonderful hosts and nothing is too much trouble. We are looking forward to many more visits. A wonderful holiday venue in a beautiful and interesting location. This was our second visit and we've booked again for next year. Need we say more! Really friendly owners. First time staying at a holiday cottage and were very pleasantly surprised! Everything was very well thought out, very clean & comfortable - couldn't have asked for more - just better weather but, that's England. All the little treats made it even more special. Thank you? Perfect property - peaceful, restful and tranquil. A property of a very high standard with emphasised green credentials. Numerous walks and places to visit. An idyllic Roseland holiday destination. Roundhouse Barns never fail to impress. They have the "wow" factor and we have now stayed in all three of the self-catering cottages; each having its own unique character but all consistanly presented to the same very high professional standard as well as being comfortable and well equiped . It is an added bonus that the friendly owners are on site and always ready to provide help and advice, not to mention their personal welcome (and good bye). The location may at first appear to be out in the sticks a bit but the King Harry ferry, St. Just in Roseland and St. Mawes are a short drive away and in terms of sight-seeing the Barns are actually well located for visits to the many English Heritage and National Trust properties and gardens and other similar attractions found in West Cornwall. Most places are within an hour or so drive or you can forget the car and enjoy lovely walks along the River Fal or simply relax in the pretty manicured gardens - it's what ever you want. In our opinion, the Barns really do take some beating and owners never appear to sit on their laurels and do pay a lot of attention to detail. Very comfortable cottage with everything thought of. Nice additional touches such as flowers and a cream tea. Very clean and bed was very comfortable. Would stay again. Excellently equipped, modern decor and facilities. Close to a number of scenic and coastal walks. St Mawes and Falmouth via walks and ferries close at hand. Two lovely pubs within decent walking distance, others by car. The local ferry to get you off the Roseland Peninsula good value for money and close by.